The text of this story is a press release from the Mormon Tabernacle Choir. The choir is asking for singers, choirs, and fans alike all over the world to upload a YouTube recording singing one of four parts (soprano, alto, tenor or bass) of the well-known “Hallelujah” chorus from George Frideric Handel’s Messiah. The best performances and choral voices will be featured in a “virtual choir” performance with the Mormon Tabernacle Choir and Orchestra at Temple Square. To help singers record and upload their videos, participants can access the sheet music, a sing-along video for each part and conducting by music director Mack Wilberg. Once their video is recorded, singers can upload it to YouTube and copy the URL into a simple submission form. Musicians and YouTube stars like Peter Hollens and Tiffany Alvord already have expressed interest in this project and are encouraging their fans to upload their own recordings. Hollens and his wife, Evynne, are providing the vocals for the sing-along videos. 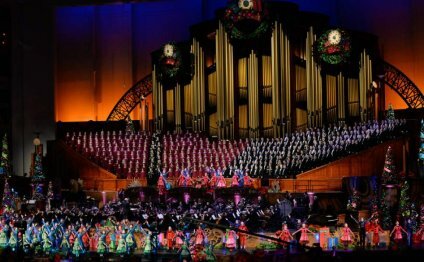 The Grammy Award-winning, all-volunteer Mormon Tabernacle Choir is made up of 360 men and women who join their talents to create their trademark, instantly recognizable sound. The choir is accompanied by the Orchestra at Temple Square, a 150-member symphony that is likewise all volunteer. Their world-famous sound is under the direction of music director Mack Wilberg and associate music director Ryan Murphy. March 4, the choir and orchestra will release a new recording of Handel’s Messiah in two versions: the Complete Oratorio and a 60-minute highlights version. They will stream Messiah live at 7:30 p.m. Good Friday, March 25, from a performance in the Salt Lake Tabernacle.